Fisher-Price Introduces T.M.X. Elmo Extra Special Edition | OhGizmo! Elmo toys have been a holiday staple and some of the hardest to find gifts for kids the last few years. To keep up that tradition Fisher-Price has announced a new T.M.X. Elmo Extra Special Edition that will be available on November 13. This new limited edition Elmo toy has new surprises that kids can discover by posing Elmo and tickling him in the correct sequence. 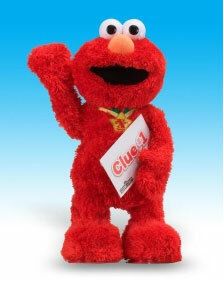 To distinguish the Extra Special Edition Elmo for the normal Elmo, the Extra Special version wears a gold badge. Fisher-Price includes a poetic hint with Elmo to help you and your kids figure out how to unlock the first surprise, which is a special song. Other hints will be provided via the Fisher-Price website in the coming weeks. The T.M.X. Elmo Extra Special Edition will retail for $39.99. If previous Elmo insanity teaches us anything, this will be one hard toy to find and will be selling on eBay for much more that retail. I think Fisher Price toys are excellent. We've just bought a Fisher Price Jumperoo and our little lad absolutely loves it. He bounces about and spins around in it for hours. And the lights and sounds encourage him to move and bounce about so it's great for his developement. I love fisher price toys. We've recently bought a Fisher Price Jumperoo for our little lad and he absolutely loves it. He can spin about and bounce up and down for hours on end and the light and sounds encourage him to move so it's great for his development too.